Today went well. Mac was incredibly cranky this morning after resting little and eating less than normal. By the time the nurses got to their poking and prodding he was not to be messed with. That said, he made it through both procedures with flying colors. We were home just four hours after we checked in. Mac is a champ. More to come when we have the time. Thank you so much for all your care and concern. This was a minor hurdle, but we're glad to have cleared it. Tomorrow's the day. Ear tubes and an echo. It's a veritable twofer. 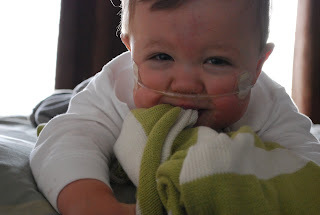 We ask for your best thoughts, a little room in your prayers, and for McKay to unveil his first words on Friday. I realize that last one might be a little too much to ask. But I have a feeling he's been saving up. Mac is officially a walker now. But he doesn’t walk. He swaggers. Like some wild west sheriff taking stock of his town. His arms hang straight down to the side, a slow side-to-side momentum in the hips, legs spread far enough apart to slow the ache from being saddle sore. His tipsy ways make you wonder if he’s just come from the saloon or if he’s reeling from an outlaw’s fist to the chin. I’d ride off into the sunset with this kid any day of the week. This was going to be a smug entry about how prepared I was to meet our newest doctor today. How I ordered McKay’s complete medical history. How I tabbed out all the relevant visits. How I documented the timeline his last six months of near continual antibiotics and how this entire ear fiasco has now reached its crescendo in an inexcusably late visit to him, a specialist. In short, I was obnoxiously over prepared for our visit with the ENT today. Instead of inspecting the oh-so-impressive paperwork I had prepared, we chatted. 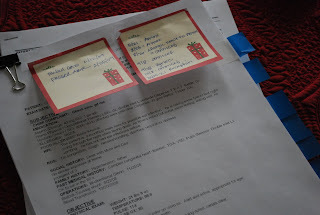 He scribbled notes and I rattled off procedure dates and recounted courses of medications. 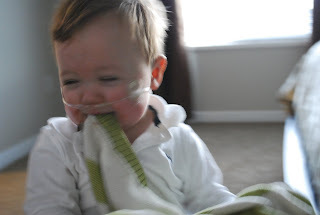 We talked about events to come this year and how important it was that Mac had the option of antibiotics that work when he needs them and a body that has not been so overexposed it refuses to cooperate. Then he took a good long look into Mac's tiny ears. Tubes. After taking McKay’s history, our new specialist agreed we needed to check this little complication off our big guy’s list. Then he impressed me. Most docs, it seems, don't like to share. Procedures. Operating rooms. Focus. But he asked if I had any objections to doubling up on procedures when they sedate McKay for an echocardiogram in the next month or two. Absolutely not. The less anesthesia episodes the better. It was a move that showed his humility and respect for Mac’s heart...and mine. Love that. 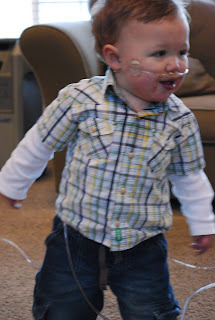 More details~Because of the fluid that is constantly behind McKay’s eardrum, the doctor estimates he is experiencing a 30 decibel or 20-30 percent hearing loss that could be immediately reversed with tubes. 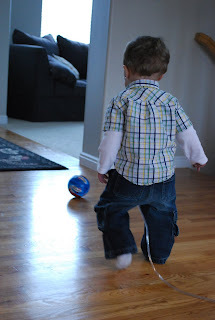 We talked about his speech delay and other developmental milestones that have come and gone. "He'll catch up," he said. "Don't worry." Beyond eliminating the physical pain of constant ear infections for McKay, on a selfish note, I just want to hear his voice. I’ve waited entirely too long and worried entirely too much about this little man not to have earned a word or two. I think hearing him spurt out “mama” will make an absolute mess of me. Update: I just spoke with the hospital. Cardiology and Otolaryngology have agreed to coordinate McKay’s next sedated echo and his ear tube surgery next Thursday, Jan. 21. Less talk. More action. Gotta love that. I started doing yoga about a year ago. After days of letting the pavement pound my joints, it seemed like a good idea to treat them to a good stretch for at least an hour a week. Although I've really come to love my yoga class, I'm only able to squeeze it in once or twice a week and I am still very much a beginner. Yoga as exercise (especially to a runner), can be deceiving. This slow-moving, intense movement is not as easy as it looks. As the instructor leads you through a series of poses you are asked to balance, lift, and shift your own body weight, stretch muscles heretofore undiscovered, and redirect blood flow from your legs, head, and arms. I have left one hour of yoga more sore than I've ever been from some of my longest runs. But it's a good, deep, man-I-worked-something-important-today sore. And at the end of each session I feel a serene sense of calm, center, release. Of course yoga is an ancient practice that has survived through centuries of diets, infomercial gadgets and miracle pills. And if I had any doubt it was built on a study of the body's natural movements and needs, my little yogi has put that doubt to rest. Over the last few months, McKay has taken to one particular yoga pose: The Downward Facing Dog. I've done my best to capture his yoga prowess in pictures, but he is so unpredictable with it that by the time I grab the camera, he's through. The best I can do for you is this shot from last summer with his physical therapist. He now gets into this position all on his own and we've seen him hold it for up to a minute. I mentioned his like of this position to his pediatrician at his Synagis appointment on Tuesday--by the way, it's been two weeks since the Rocephin shots and there's no sign of another ear infection! !-- and he grew intensely interested. After a discussion of when and why he might be throwing himself into the downward dog several times a day, he mentioned something to me about "Tet movements." According to Mac's doc, Tet movements were dubbed so when doctors observed kids with a congenital heart condition called Tetrology of Fallot getting into body positions that promoted increased blood flow or decreased pulmonary pressures. It can be a headstand, a deep squat, anything that opens up arteries and increases blood flow. Interesting, no? He theorizes that McKay can sense when he needs increased blood flow to the brain or decreased pressure in his pulmonary arteries and so assumes the downward dog position until he feels better. Mac's pressures have always checked out great through echos and a heart cath, so I'm not overly concerned with the new practice. Of course I will discuss all this with McKay's cardiologist, but for now I am absolutely fascinated by the idea and wonder if anyone else has experienced this with their kids. 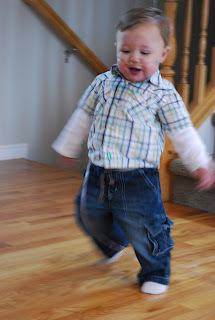 The additional bonus to Mac's little workout routine is a decidedly stronger upper body and the ability for him to transition from the floor to standing without any assistance. It seems daily yoga is making McKay stronger. I just thought I'd chronicle this little oddity and ask if other heart families have observed similar behavior in your little ones. Because, hey, if there's enough of us, perhaps we could start a studio. How posh would that be? :) Namaste. in with the mojo required to let good things happen. and remind me who I can be. in with runs that respect the journey. in with health in mind, body, and spirit. in with welcoming all that can be. in with the peace of three busy boys. You will be a decade of changes. And victories. And joy. We will look for it everywhere. We will find it in everything. Because you usually get what you expect. In life. In people. In every day. Here's to a truly Happy New Year.